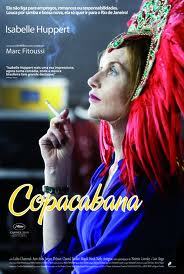 FilmLand Empire: I Love You, Isabelle Huppert! 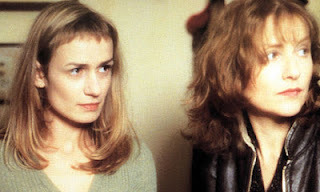 I have been meaning to write this post for a long time, but given that today is Isabelle Huppert's 60th birthday (well it was actually yesterday), I felt it was the perfect time to do so. This is not meant to be a complete review of her prolific filmography. I must admit I have seen less than half of it and other people would be better suited to write this. But love stories are always very personal, and my story with Isabelle is no exception, now is the time to share it. Interestingly, it was not actually love at first sight. As a film fan teenager growing in France in the late 80's then early 90's, and a big fan of Isabelle Adjani at the time, Isabelle Huppert had not exactly registered on my radar. I wasn't aware of of earlier films, and while she had a commendable career at the time, she seemed stuck in a certain kind of parts of bourgeoises, in a not so glorious time when French cinema seemed stuck in its "rive gauche" period. Worst, there was the infamous incident of the "couvourien" in 1988. "Couvourien" or La couverture ou rien (the front page or nothing) was an insidious practice by publicists at the time, who refused interviews to publications unless their clients had the front page. 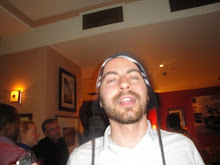 And French magazine Premiere decided to break the silence at the time over this odious blackmail. While not actually naming the two stars who used the "couvourien" blackmail, their editorial made it very clear who it was: Isabelle Huppert and Mickey Rourke. 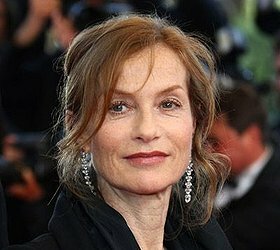 The first inkling I had of Miss Huppert's tremendous talent however was with her wonderful performance in La Cérémonie, for which she won a well deserved César (the French film awards) for best actress. Sadly that year, while she gave an almost shy and reserved acceptance speech, she was completely outstaged by Annie Girardot, who won a best supporting actress award and had a complete meltdown on stage, with a painful admission on how she had felt abandoned by French cinema. No prize for guessing what part of the ceremony was relayed by the news. There was also Amateur by Hal Hartley in 1994, an unusual escapade in the US indie cinema for a French actress of her stature. Asked at the time how this came about, she explained that she simply wrote a letter to the American director expression her desire to work with him, being a big fan of his cinema, the first sign of a more international and interesting career which came later. But then in 1998, for my last visit in Cannes before a 15 years gap, I saw her in L'école de la chair by Benoit Jacquot, the utterly boring story of a Parisian bourgeoise who falls in love with a younger man. It was dull, her character was uninteresting and it was safe to say I didn't expect much from her career after that. And yet... Of course there was always the ongoing collaboration with Claude Chabrol, who gave her some of her best parts. 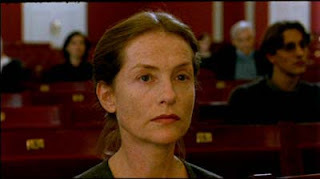 But to me she reemerged in the terrifying The Piano Teacher by Michael Haneke, giving one of the finest performances by any actress ever, a world away from her usual parts. This was a acting masterclass, revealing a harshness and some dark zones in her persona that I never expected from her. She was rightly rewarded by a best actress nod in Cannes. On the opposite end of the spectrum came 8 Women, the delightful and colourful film by Francois Ozon in which, against the cream of French actresses, she delivered an unusually funny performance as an uptight woman who let it all out! And the funny streak carried on with I Heart Huckabees, in which I was surprised to see her have a lot of fun in the character of a crazy French metaphysician philosopher/therapist who rolls in the mud with Jason Schartzman, a far cry from her usual bourgeoises. Back into darker territories, she also took on a ballsy character in Ma Mere by Christophe Honoré, in which she plays the mother of Louis Garrel, living in a sort of reversed utopia, a world of unbridled sexual instincts and devoid of any moral. Again, far away from her usual bourgeoises and with several scenes that made me wince (the one in the taxi with her son and the probing finger and, aherm, I'll stop here), she took my breath away with such a bold part to take on. Following these great parts, she delivered a great string of wonderful performances in very different films such as The Sea Wall (adapted from a book by Marguerite Duras), Villa Amalia and White Material, in which she carried on pushing the extent of her acting skills. That same year, she also worked with maverick Filipino director Brillante Mendoza, Captive, a new talent she had noticed (and rewarded) as the president of the Cannes Film Festival jury in 2009. This is precisely what I like about her at the moment. She spots a new young foreign talent with much enthusiasm (and I remember watching an interview where she expressed how fascinated she was by the unique cinema of this director), and doesn't think twice about asking them to write a part for her. It is all the more interesting as this is precisely the kind of challenges and risks that the two former reigning queens of French cinema, Catherine Deneuve and Isabelle Adjani, used to take and have all but given up on. Not that he reputation she has for being difficult has completely gone away (that old chestnut: men know what they want, but women are branded difficult). She is said to have been the most difficult president of the Cannes Film Festival jury, pretty much waging a war on all the other members (suffice to say we won't see her working with Asia Argento!). But all the directors who have worked with her recently have spoken of the pleasurable experience that it has been (I was recently reading an interview of Hang Sang Soo where he was gushing about her). Yes she is demanding, but she is also very open to emerging talents and respectful of her directors on the set. I also had the pleasure to attend a talk with her at the BFI in 2011 where she received a fellowship. She talked about her career, and her enthusiasm and passion for cinema in general were infectious and sincere. There was also the slightest hint of shyness in her, for all her determination and reputation. We were also treated to the screening of Copacabana, which sadly was never released in the UK, and which showed yet another facet of her talent. In it, she played a free spirit who, despite having a daughter, had never been able to settle down, following her passion and heart. That sort of slightly eccentric woman that could have ended up completely OTT with another actress, but not with her, she offered depth and subtlety along with the fantasy, giving a real heart to what could have been a one dimensional part. And her career is showing no sign of waning, with some more exciting parts in the pipeline. She will play Catherine Breillat in a film about her real life liaison with a young crook who took advantage of her in Abus De Faiblesse (which I suspect will be in Cannesthis year). She is also in the intriguing two parters: The Disappearance Of Eleanor Rigby: His and Hers, with Jessica Chastain (an actress she shares many similarities with, and who has expressed her admiration for her). She was meant to be in the Suspiria remake playing Miss Tanner, which sounded crazy enough although sadly the project has now been canned. I would have loved to see her in a horror film, such a shame! And because the excitement never ends, her newest project is the Dom De Lillo adaptation of Body Of Art, sharing the screen with Sigourney Weaver, Denis Lavant and David Cronenberg! There is something so utterly refreshing and exciting about an actress of her age and stature, who could have played it safe and yet has pushed her career into an unusual and diverse path, as if she just cared about having some fun and letting her passion guide her above any other consideration. Her acting has never been showy, it is at once very precise yet always natural, totally inhabiting her parts with much subtlety (notice how she has never felt the need to change much physically for any of her parts, she does not need this kind of artifice, her talent alone shines). I just cannot wait to see where her career takes her, and I am not afraid to say it: I love you Isabelle Huppert!